Are you interested in reselling our Retail/DIY, Professional or Flooring products? Click for prequalifying information. Signing up is fast and easy. 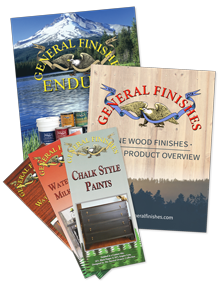 Download the latest copies of General Finishes brochures now! Visit the new General Finishes University for a list of upcoming training, events, and demos. Just type in your city, town or zip to find GF store locations near you. How can I lighten Java Stain? How can I tell if my finish is dry?